A picture is worth a thousand words, but why limits yourself to just one picture? 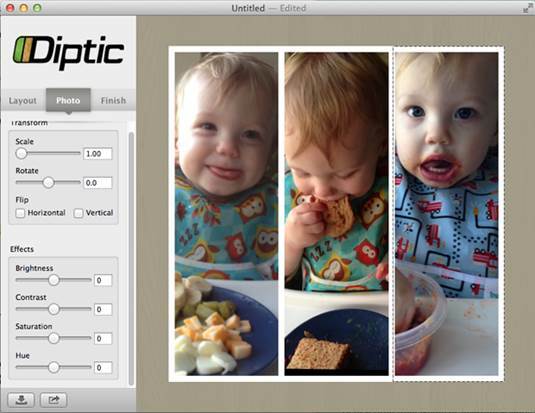 Diptic lets you create square-formatted collages of up to six photos. This is a port from iOS (the universal iPhone/iPad app is also $0.99), and it’s just as easy to use here, with Multi-Touch trackpad gestures and easy-to-understand options and sliders. All the frames are adjustable, and you can drag in photos from the Finder, iPhoto, or Aperture, or access those libraries through the Open File dialog. (Scroll all the way down and click Media at the very bottom of the sidebar to see your iPhoto and Aperture albums and events – the Media browser is a little hidden). Diptic lets your photos tell a story. You can adjust the brightness, contrast, saturation and hue of each photo individually under the Photo tab, or of the whole collage under the Finish tab. That tab also has an Aspect Ratio slider that lets you change the collage from 1:1 square all the way to 1:5 or 5:1, which is nice, but it’d be better if that option was on the Layout tab, where you’re selecting the template. It’s weird to go through the whole process thinking you can only make a square photo, then get to the end and find that’s not the case. 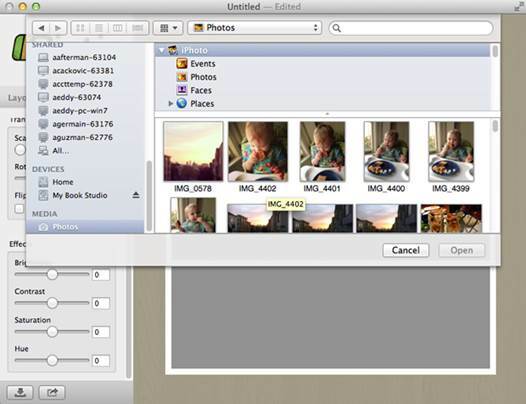 You can drag photos from iPhote or Aperture, or scroll all the way down in the open-file dialog for the Media browser. For only a dollar, Diptic is a bargain. · Positives: Easy to use. All frames are fully adjustable. Multi-Touch trackpad gestures. High-res export. · Negatives: Media browser to import from iPhoto and Aperture is a little hidden, and the ability to tweak the aspect ratio comes a little late in the process. For the price of a happy-hour pint, SimpliBudget can cover the basics of financial planning and budgeting (including earmarking some funds for happy hour). The program features password protection, and iCloud syncing to other Macs or the $1.99 universal iPhone/iPad app. Support for QFX, QIF, and OFX file formats allows you to download and import your bank statements. And the simple interface makes it easy to tell where the lion’s share of your dough is going. Readily import your financial data into the Transactions window, and then go from there. The app is solid, with just a few kinks to iron out. While instructional videos on the simplibudget.com web site help, it takes some trial and error to realize you have to switch over to the “Transactions” window to import your financial data. Some spelling errors also surfaced, and we wish we could change categories by double-clicking and typing something new, instead of only choosing from a list. While it’s not as robust as a full-service app like iBank ($59.99), for basic budgeting and expense tracking, SimpliBudget has you covered. · Positives: Easy to create a monthly budget. iCloud syncing to other Macs and iOS devices. Good tutorial videos on web site. · Negatives: Some text-drawing/grammatical errors. Difficult to quickly change categories for imported transactions. Some trial and error involved in importing financial data into application. Mint.com is such an amazingly helpful resource that it’s almost unbelievable to think that it’s free. We can input all of our various financial accounts – checking and saving, credit cards, loans, investments, and more and track them all in real time from the sleek web portal or the iOS app, which is much handier than juggling logins for each institution’s website. And now, thanks to the excellent and free Mint QuickView app, you can keep an eye on your finances with a single click on your Mac. 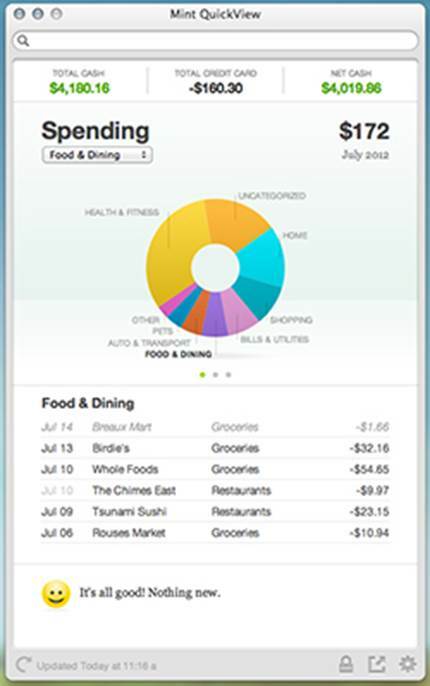 Mint QuickView lets you scope-out all of your essential financial info with a glance. Mint QuickView nestles a handy icon in your menu bar, a click of which provides a handy at-a-glance view of your current financial situation. It shows your total cash and credit card debt, along with a breakdown of spending by category and a listing of recent transactions across your accounts. A quick swipe or click of an arrow shifts the perspective to your net income, a glance at your budgets, or a breakdown of accounts, while the bottom of the interface shows tips that’ll help you improve your financial status or better use the service. The info updates regularly with a numerical badge over the icon that alerts you to recent transactions or changes, and if you’re worried about having all of your private financial info so readily accessible, don’t be: you can set a PIN and use it to hide everything with ease. 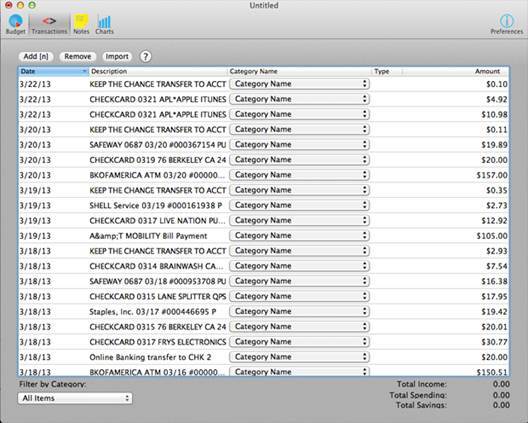 If you use Mint to balance your budgets, QuickView is an absolutely essential enhancement for your Mac. In the world of password-management applications, the program that saves you time gets the glory. pwSafe serves as a secure repository for your various passowrds. You can enter individual URLs with the site’s username and password, and optionally sort them into catefories, like Finances or Social Networking. When you want to log on, select an entry and slick the Open button. pwSafe will open the site in your browser and load the password in your clipboard – you just enter your username and paste in the password. pwSafe can generate new passwords for you, with whatever criteria the site in question requires. 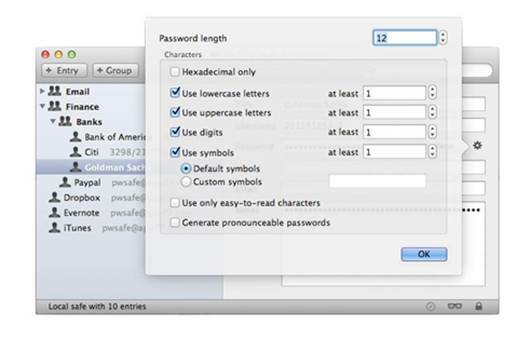 This is much more secure than jotting down lists of passwords in an unencrypted text file somewhere on your hard drive, and since you don’t need to keep your passwords memorized, you can let pwSafe generate strong passwords for you. Even better, pwSafe uses iCloud to sync your data across Macs or to the universal iPhone/iPad app. 1 Password is the gold standard, but it’s also $49.99 for Mac and $17.99 for iOS. At $5.99 for Mac and $2.99 for iOS, pwSafe is worth a look for increased security without a big buy-in. · Positives: Excellent functionality and stability. App serves all its core functions and hooks in beautifully with iCloud for use on other Macs and iOS devices. Great feature set for the price. · Negatives: Program’s functionality/means of operation are a little vague at first. Introductory tutorial video would be a welcome addition.